This seven day workshop will take place from June 6th - 12th and will explore how technology can help us create deeper connections with the world around us, each other, and ourselves by combining the latest advances in bioinformatic sensing technology with modes of physiological awareness found in somatic performance practice. 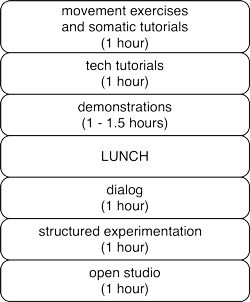 Activities will include seminars and practicums on somatic performance and movement, and technical foundations on working with bioinformatic sensors with media based software such as Max, SuperCollider, and Processing. In additon to the workshop schedule below, each of the first five days will feature a guest speaker as part of a speaker series from 5:30-7:00pm that will be open to the public throughout the workshop. All speakers will be participating in the workshop. A group of students exploring movement and biosensing using Biopac MP40's at Virginia Tech. Photo: Alan Macy. introduction (June 6th) The first day will be an introduction to the concepts and materials that the workshop will explore. Session will last from 9:00 am - 4:30 pm. solo (June 7th) The second day will look primarily at the individual personal connection between embodiment and physiological data, and see if it is possible to discover awareness with the systems of the body that are normally consciously ignored. Session will last from 9:00 am - 4:30 pm. duet (June 8th) The third day will focus on the connection made between two people and see if there is a way that one can influence the embodiment of the other, and if the experience of embodiment can be shared. Session will last from 9:00 am - 4:30 pm. ensemble (June 9th) The fourth day will focus on the exploration of psychosocial potential of the combining of embodiment and physiological data by looking at how this technology could be used to explore group experiences, and the ability of the performer to affect the audience. Session will last from 9:00 am - 4:30 pm. audience/environment (June 10th) The fifth day will turn to the role of affect and the audience and environment, in particular how the performer can have a biofeedback relationship with the audience and environment of the performance. Session will last from 9:00 am - 4:30 pm. étude (June 11th) On the sixth day participants will focus on creating and presenting a short study that combines physiological tracking with bioinformatic sensing in a performance or other participatory interactive study. The presentations will include a short introduction, the presentation, and a short discussion. Session will last from 9:00 am - 4:30 pm, with presentations from 5:00 - 7:00pm. roundtable (June 12th) The final day will be dedicated to a debriefing roundtable session that will sum up the experience of the week. During the round table participants and team members will have the opportunity to synthesize what unfolded over the course of the week through discussions that will help outline new goals and directions in this work, and establish long-term connections between the members of the workshop. Session will last from 10am - 2pm. The following is a general overview of the structure of the workshop. We seek to find a blance between somatic work and technological development. We also seek to find a balance between structured activity and allowing participants time to have the opportunity to explore ideas on their own. The intent of this sturcture is to keep the workshop flexible, but well organized. A typical day will last from 9:00 am - 4:30 pm. A more detailed schedule will be sent out to participants in the week before the workshop.